One of the popular routes between the M23 and Goodwood takes you along the A29 through lush Sussex countryside. 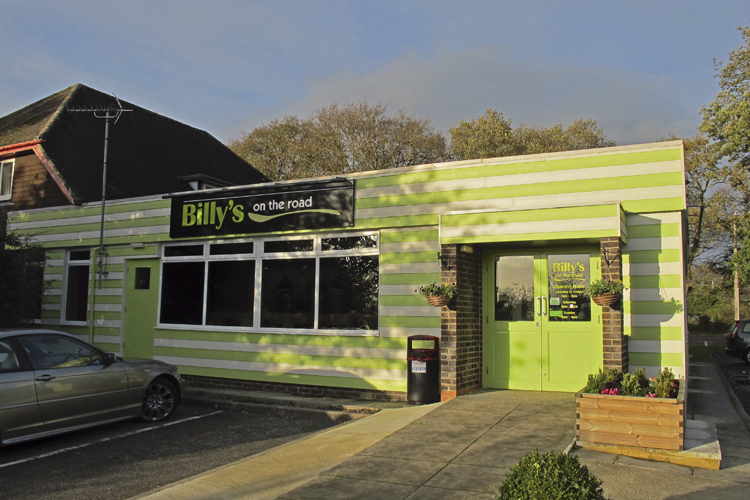 On the edge of Five Oaks village, near Billingshurst, is a wayside café-restaurant, Billy’s On the Road. It takes its name from its female chef-patron owner, and bills itself as “Fresh, fast and fun”. It’s a fair description of what to expect inside. It used to be a Little Chef, and tucked discreetly behind is a Travelodge. Two years ago the café was taken over, refurbished and rebranded, given a homely 1950s ambience and some clever features. There is genuine artwork on the walls, fresh flowers in the vases, and a children’s area with a classic old doll’s house and bulging bookshelf. The wow feature is a vast coin-in-the-slot glass-topped model railway that doubles up as a convivial bar-table with its own built-in entertainment. The coffee served is a bespoke blend from fresh-roasted beans and prepared in a barista-style espresso machine. Food is freshly cooked on an open grill that wafts mouth-watering smells. The staff are friendly and welcoming, and the wifi – when working – is free to use. It is all in a very different league from what was there before. “Big on breakfast, Big on Brunch” says the extensive menu, and everything is served all day. 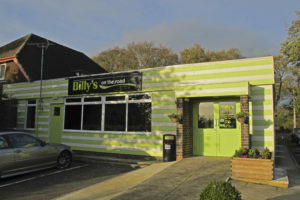 The staple is Billy’s Big Breakfast, fairly priced at £7.95 for a very generous plateful: two fried eggs, two rashers of bacon, sausage, fried potatoes, mushrooms, beans or tomato, and toast. Other offerings include a variety of other breakfast dishes with names like Boy’s, Cowboy, Smoky, Fishy, Squeaky, Nutty Butty, Frenchie or Swiss, plus staples like fish and chips or spaghetti, steak sandwich and toasties. 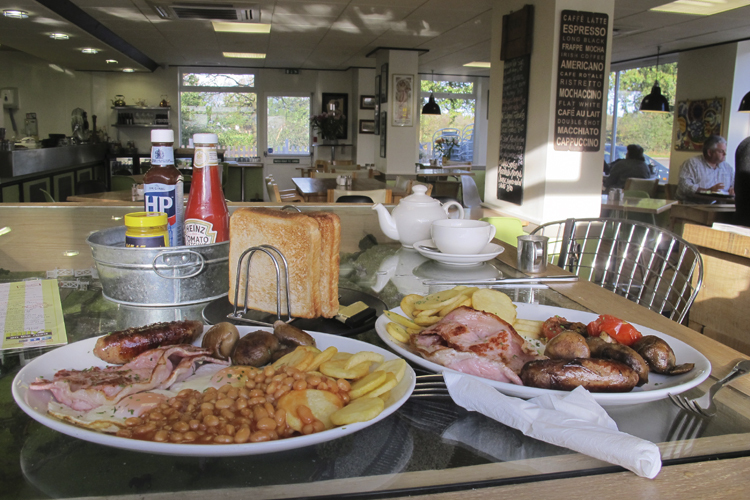 It’s novel to sit tucking into a lavish Billy’s equivalent of a full-English, with a locomotive chugging along beneath the glass table top under your plate. No wonder it’s a favourite with local school children and classic car clubs, as well as canny drivers heading for Goodwood and the south coast.